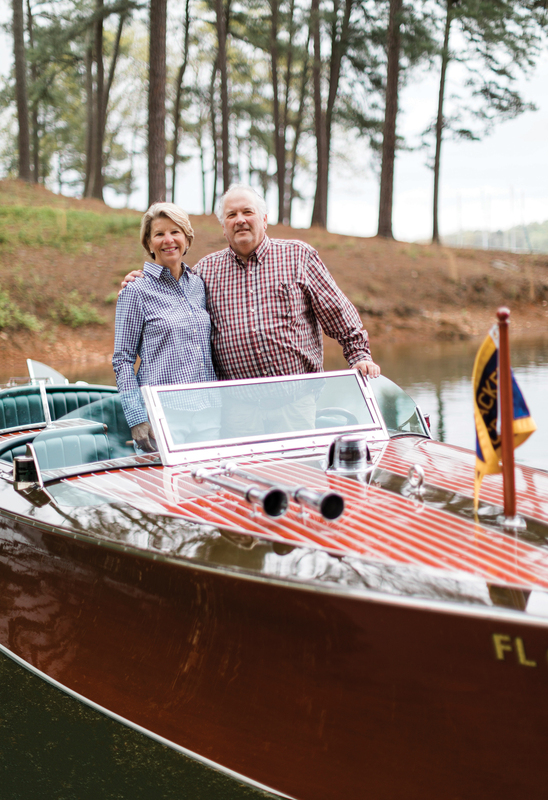 Mary Helen Heaner has fond memories of visiting Lake Allatoona as a child growing up in Rome, Georgia, and she always hoped she’d have a home there. Last year, she and her husband, Andrew, built a new house on the lake’s southern shore in Acworth, creating the perfect meeting point between their home in Sandy Springs, business in Atlanta, their son in Roswell, and their commercial cattle operation and exotic animal farm in Rome. Mary Helen and Andrew Heaner brought the handcrafted Hacker-Craft down from Lake George, New York. The house is designed for casual, relaxed living. The couple can enjoy their cozy heated screened porch in all seasons. “It’s everyone’s favorite piece,” Emily says of the antique French chandelier from The Big Chandelier. The chairs are Lee Industries. 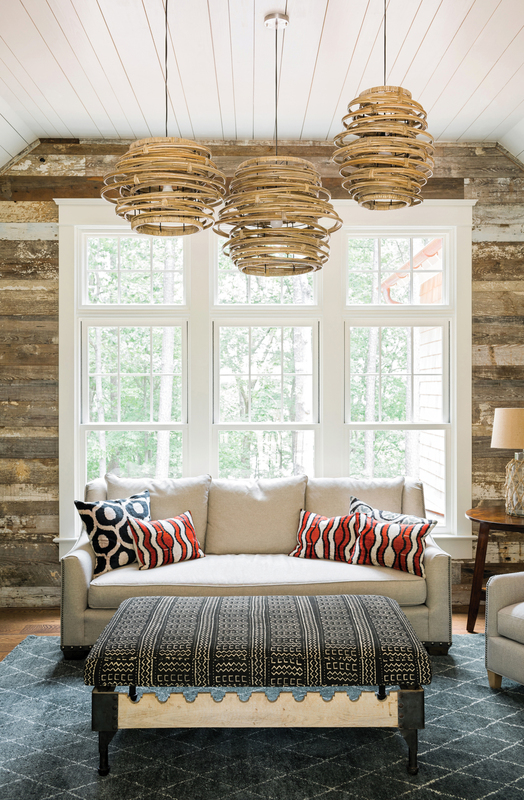 The rustic beams were taken from Mary Helen’s family’s old textile mill in Aragon, Georgia. From the get-go, the couple had an interior designer in mind. 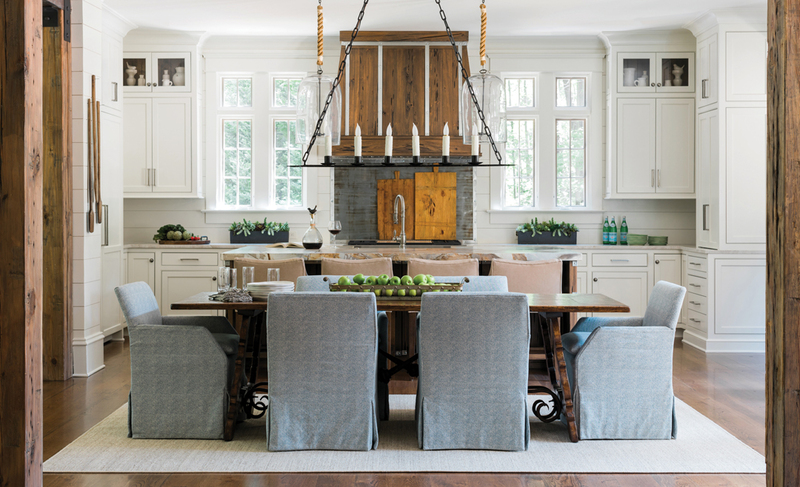 The talented Emily Karempelis, founder of EK Interiors, has been friends with their daughter since preschool, and her mother, Leslie Worthington, had helped the Heaners with furnishings in previous houses. 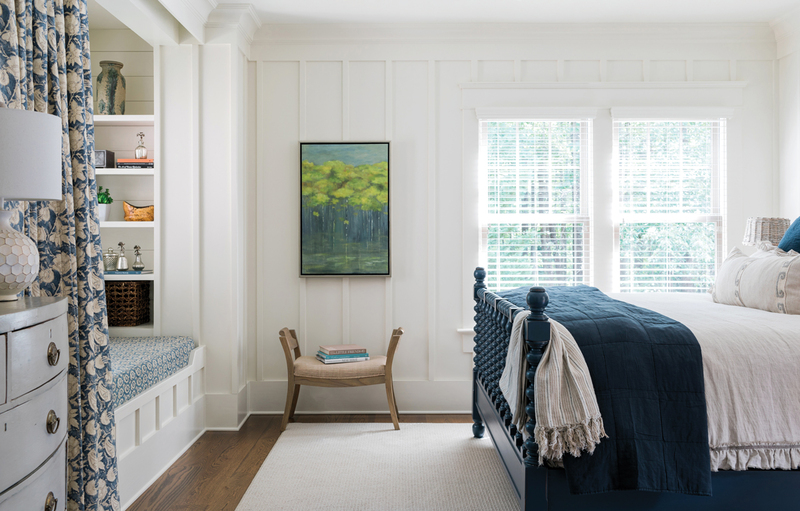 (Karempelis jokes that she brought her mother out of retirement to help with the soft goods in this project, since she typically focuses on architectural features like cabinetry and millwork.) Together, they selected a plan by architect Linda MacArthur, tweaking some details to maximize views of the lake, and enlisted builder David Sinclair to carry it out. 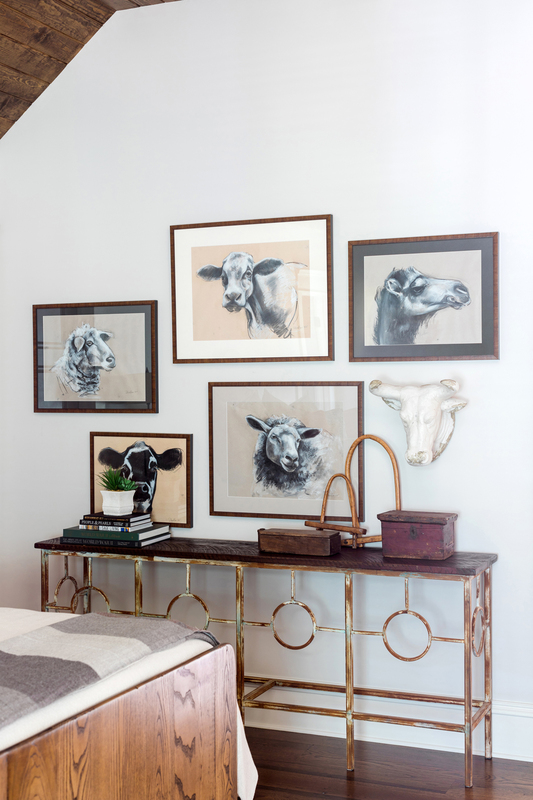 The animal drawings and wooden goat yokes in a guest room reference the Heaners’ farms, where they raise cattle and exotic animals. 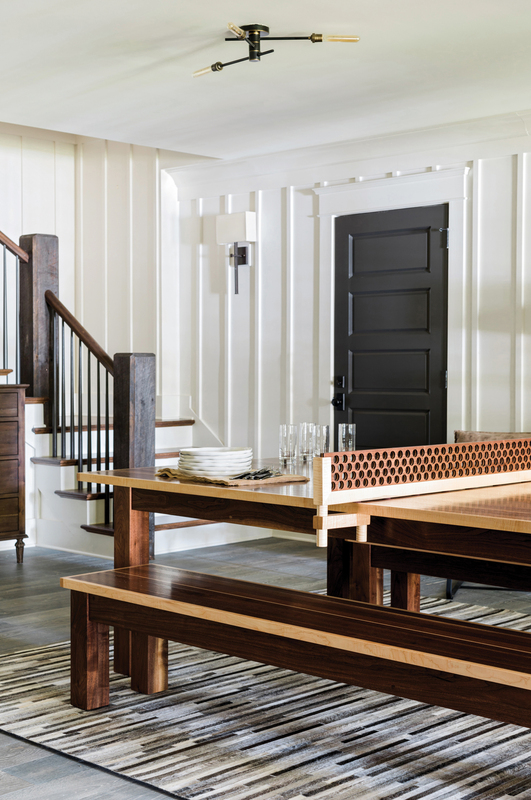 Woodworker Greg Crawford created the ping-pong table, which can be converted to a dining table in a pinch. The basement is fully kitted out as a game room hangout. 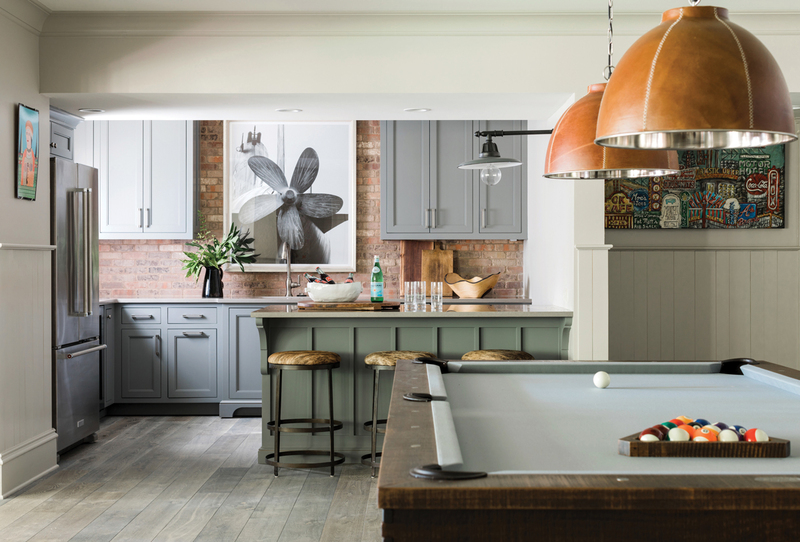 A custom pool table is inset with buffalo head nickels. 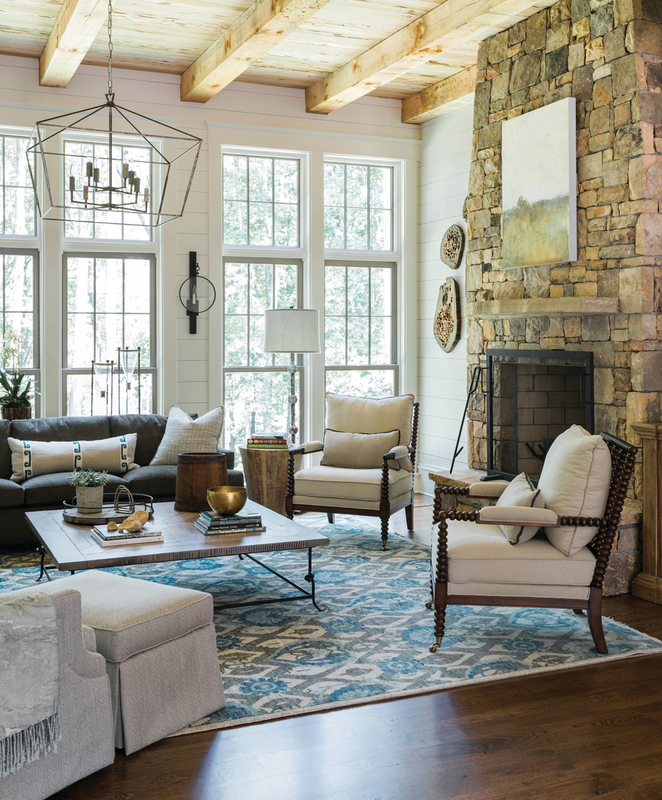 the main living area were reclaimed from Mary Helen’s old family textile mill in Aragon, Georgia. The ironwork was crafted by one of the Heaners’ farm employees, Mark Martin. Though Andrew’s primary business is insurance, their cattle operation covers 4,000 acres, and they also have around 200 exotic animals, including zebras, camels, emus, and bison. 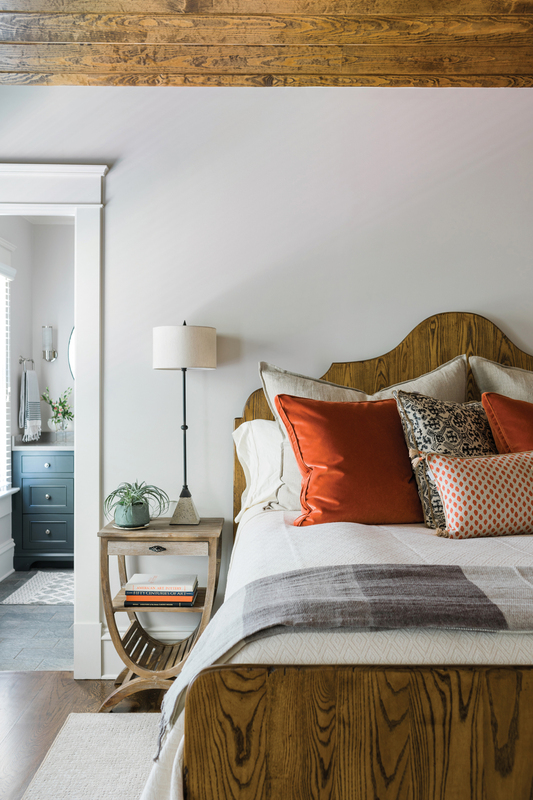 There are hints of this passion too, as in a zebra-patterned throw, the cowhide-like kitchen countertop, and a guest room with a series of animal drawings. 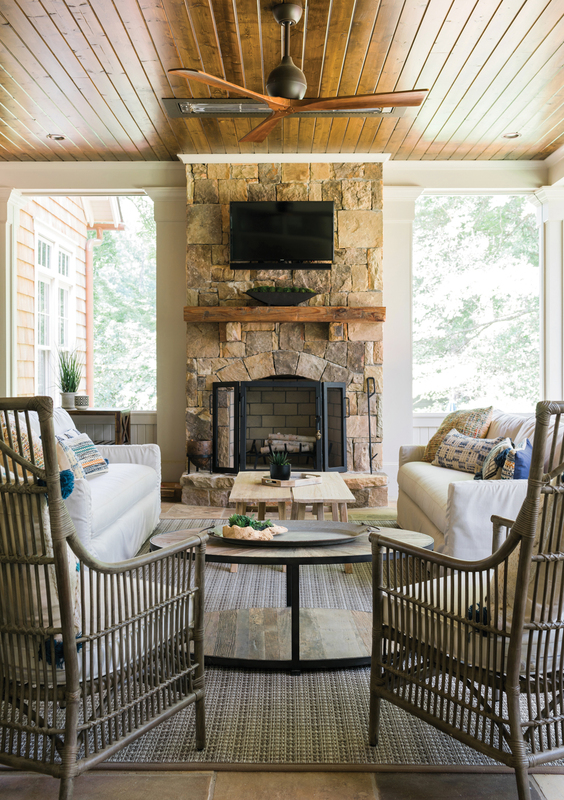 The Heaner family’s gracious home features handcrafted personal touches, like the coffee table by woodworker Greg Crawford, who also works on their farms near Rome, Georgia. Designer Emily Karempelis found many of the home’s treasures at Scott Antique Markets, like these roe deer antlers. 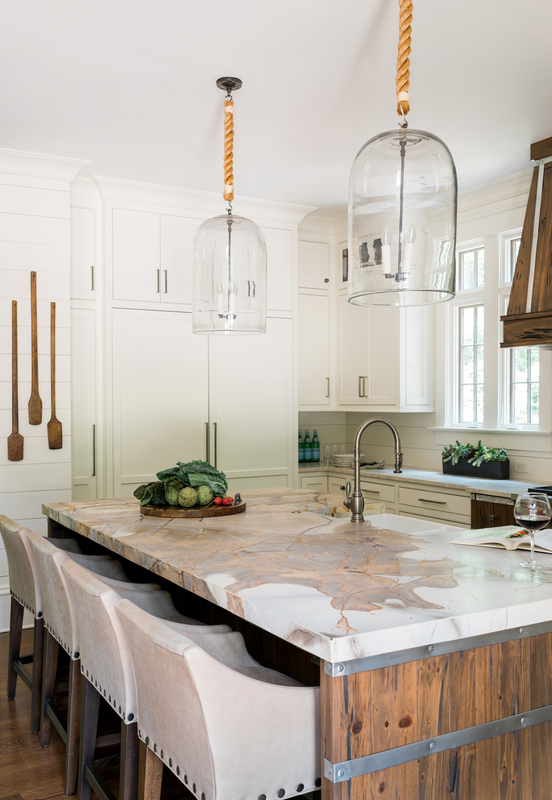 Emily chose the leather-like countertops as a nod to the family’s cattle farm. 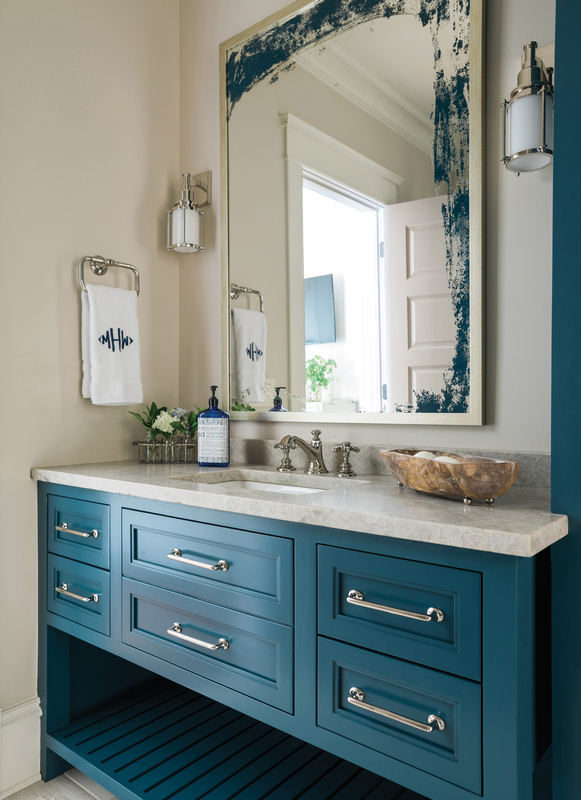 The cabinetry throughout the house is by Cabinet Resources. 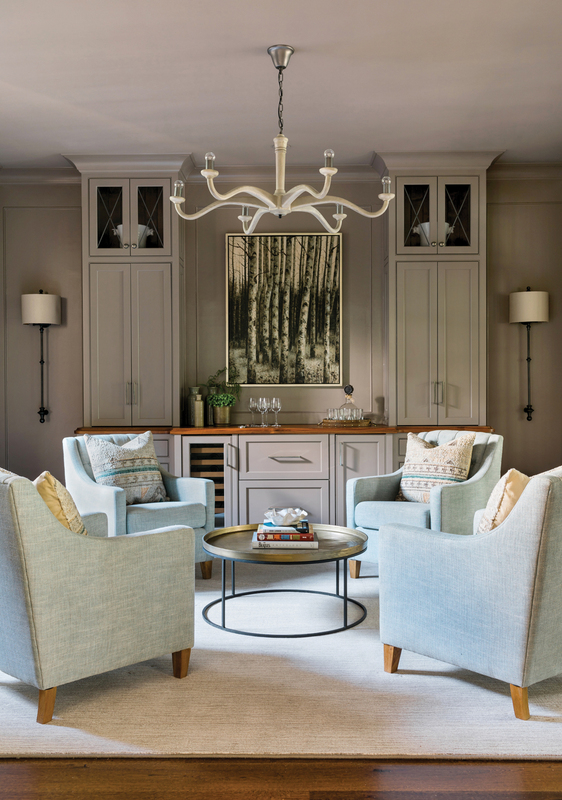 The formal dining room was turned into a “sipping room” instead, complete with a wine cabinet, ice maker, and shelves of glassware. 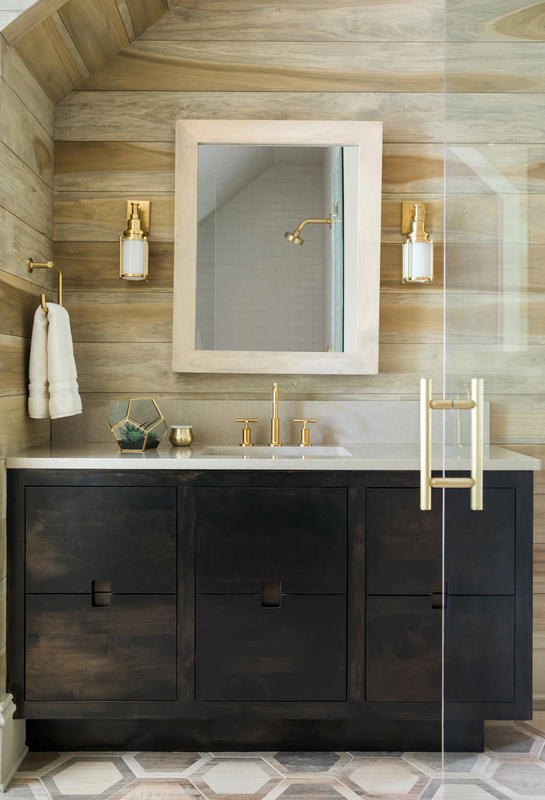 The bathroom in Andrew’s office features warm, stained poplar shiplap and contemporary tile from Builders Floor Coverings and Tile. The curtained nook, Mary Helen says, is for future grandkids. The painting was purchased at the Wesleyan Artist Market. Guest room pillows are by Lacefield Designs. Breakfast room Chandelier: The Big Chandelier, thebigchandelier.com. Chairs: Lee Industries, leeindustries.com. Game room Pool table: Olhausen Billiards Manufacturing via the Man Cave Store, themancave.com. 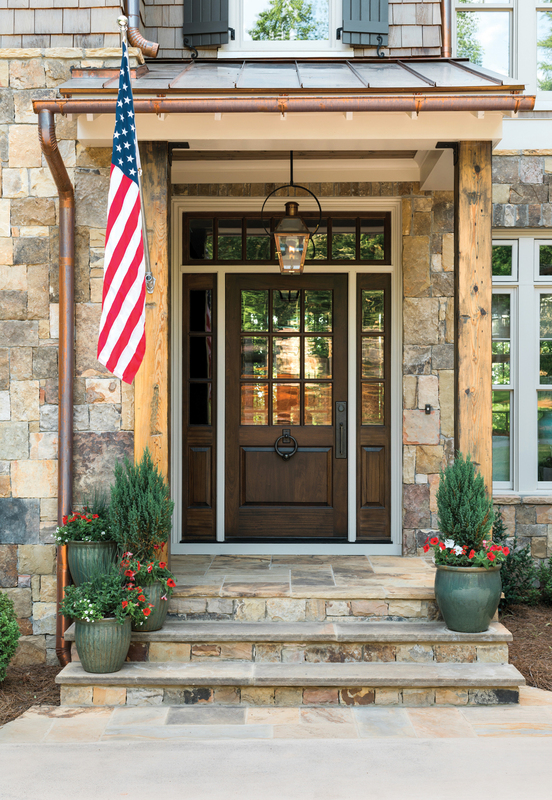 This article appears in our Summer 2018 issue of Atlanta Magazine’s HOME.